Ed Zurga/Getty ImagesTrae Young and the Oklahoma Sooners are decidedly on the bubble heading into Selection Sunday. With their loss in the Big 12 Tournament to Oklahoma State, the Oklahoma Sooners are a bubble team heading into Selection Sunday. 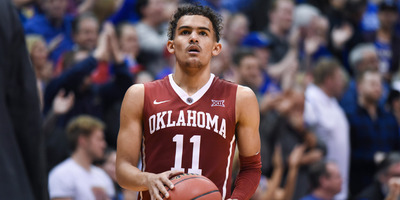 While the Sooners dropped off after a hot start to the season, they still have Trae Young on their roster – one of the most dynamic and compelling young players in college basketball. Should the Sooners miss out on March Madness, it will be the third consecutive year that one of the top players in college ball missed the NCAA Tournament. At the start of the year, Trae Young and the Oklahoma Sooners looked like a lock for the NCAA Tournament. Racing to a 14-2 start that included five wins over ranked opponents, the Sooners were ranked as high as fourth in the nation in January, looking like a lock for a top seed in the NCAA Tournament. But after an awful finish to the season brought the Sooners record to 18-13, their chances at making the tournament are looking a bit more dubious. With a loss to Oklahoma State in the first round of the Big 12 tournament giving the Sooners an early exit, Oklahoma remains on the bubble with their fate in the hands of the selection committee. While the Sooners have had their struggles, standout freshman guard Trae Young has been one of the most compelling players to watch in all of college basketball. Averaging 27 points and nine assists per game, Young has shown an ability to completely take over games, putting up numbers that look utterly preposterous in the box score of a game that only goes for 40 minutes. Against TCU in January, he boasted an absolutely absurd stat line of 43-11-7, and has threatened to hit similar numbers on numerous other occasions. Should the Sooners miss the tournament (as of now, they remain one of the “Last Four In” according to ESPN’s Bracketologist Joe Lunardi), it would be the third consecutive year that one of the best players in college basketball missed the big dance. While it would be a bummer for college basketball fans for Young to miss the tournament, chances are we’d all forget by the time the play-in games were over. The previous two top overall picks – Markelle Fultz and Ben Simmons – missed out on NCAA Tournament action with Washington and LSU, respectively, and the brackets were just as fun. That said, if any player in the field has the ability to put a team on his back and carry them to victory in the tournament, it’s likely Young. We’ll find out where the Sooners stand on Sunday.